The thermostat on your wall marks a new era in electricity. Whether it’s a dial-style older than you or a digital model installed last month, it’s become more than just a way to set the temperature in your home. That familiar gadget is now a gateway to a world where consumers have more say over their electric service. You might call it designer electricity. New technology, new regulations and new ways of thinking are reshaping the utility industry. These days, consumers can regulate the temperature in their home more precisely. 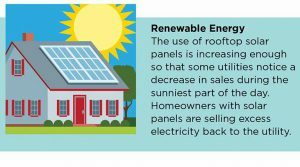 They can even generate their own electricity with rooftop solar panels and sell the excess power back to their utility. This new world started taking shape in the 1990s, says Andrew Cotter, a program manager for the Business and Technology Strategies Group of the National Rural Electric Cooperative Association. Cutting costs and raising reliability for sensitive electronic equipment was top of mind. Companies were willing to pay extra for electric service that wouldn’t blink for even a fraction of a second. Other companies didn’t need such high reliability and looked for ways to pay less in return for occasional power interruptions. A new programmable thermostat can be set to avoid heating and cooling when you’re not home, or even set separate temperatures for rooms you don’t use often. And that’s just the beginning of ways consumers are making more of their own energy decisions. Highly efficient LED bulbs can be controlled from your smartphone. Washers and dryers sense how much water and heat needs to be used to clean and dry your clothes. All that efficiency makes a difference. Americans used about 2 percent less electricity in the past three years, according to the U.S. Department of Energy’s Energy Information Administration. EIA expects that trend to continue for at least the next couple of years. “Efficient technologies really make a big difference,” Cotter says. 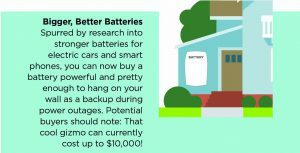 While efficiency saves energy dollars, the story of battery storage shows the bigger picture of how consumers are putting utility decision-making into their own hands. The story began with homeowners using portable, motorized generators to power refrigerators and other crucial appliances during extended electric outages. Then battery technology improved, driven by the demand for smaller and stronger chargers for smartphones and other electronics. Battery companies thought their new and improved product could grab part of the portable generator market. Two years ago, Tesla, the high-end electric car company, announced a battery designed to look attractive enough to hang on your wall and provide backup power. Other companies followed. In addition to promising relief from power outages, Tesla promoted its battery to the growing renewable energy market. 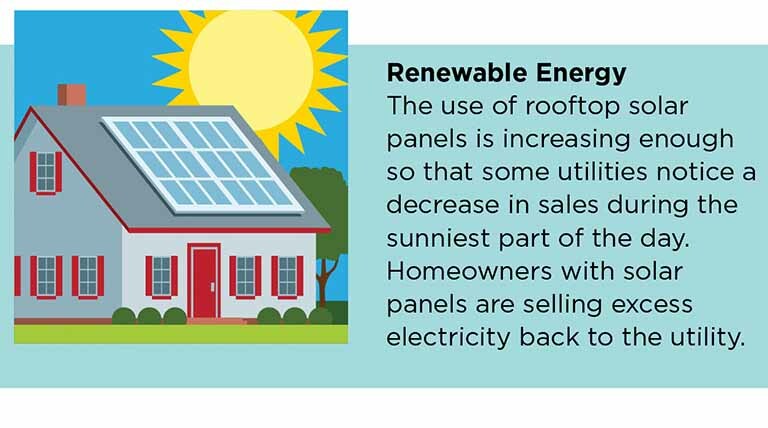 Homeowners installing solar panels on their roofs ran into a problem — they generated a lot of electricity in the middle of a sunny day, when no one was home to use it, and none at night, when they were home wanting to use electricity. These batteries could store the energy from the sunlight to use when the sun goes down. More options for consumers complicate work for electric utilities. Their business model didn’t plan for consumers storing electricity, reversing the flow through power lines as they sell electricity back to the utility or for the declining sales resulting from energy efficiency. Electric co-ops are well-suited to work toward those answers, Cotter says. He sees the member-owned, not-for-profit business structure as an advantage in a more consumer-centric industry. He says innovation can be tested broadly in the network made up of more than 900 electric co-ops across the country. He even sees a plus in co-op geography: Their service territories tend to be in rural areas. No single co-op has to test all the new ideas, Cotter says. The nearly 1,000 co-ops share results from small pilot programs across the country. They’re experimenting with batteries, incorporating home renewable energy projects into the electric grid and making the most effective use of energy-efficient technologies. While the march toward more choices in electric service might seem inevitable, Cotter sees it as an uphill battle because of one key question: Is it worth it? “Do you want to spend $10,000 for a photovoltaic system on your roof and another $10,000 for a battery to avoid 45 minutes a year of power outage?” he asks. And that’s where your old-fashioned thermostat could put you on the cutting edge of the trend toward more customer choice: You can decide you like things the way they are. Cotter advises co-op members to check with their local electric co-op before making major power-use decisions. He says that in this new era of more energy options, vendors will be promoting batteries, solar panels and other gizmos.